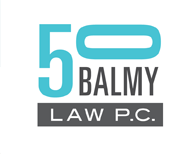 Contact | 50 Balmy Law P.C. We are in the Mission District of San Francisco, on famous Balmy Alley, between 24th Street and 25th Street, and between Folsom and Harrison. We are a few blocks east from the 24th Street BART station at 24th and Mission, along the Calle 24 Street Corridor.